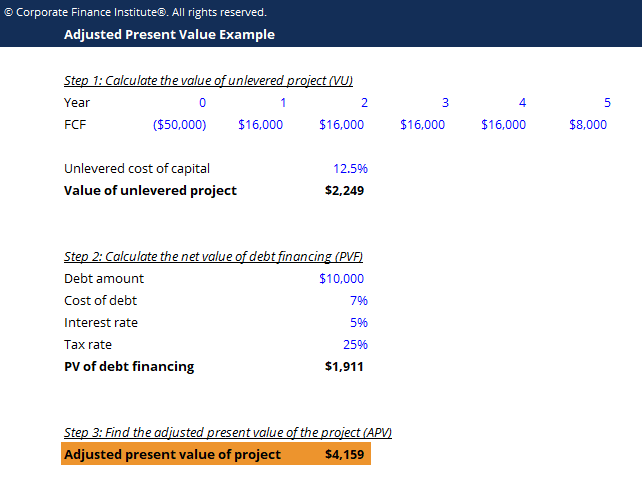 This adjusted present value template guides you through the calculation of APV starting with the value of unlevered project and PV of debt financing. Adjusted Present Value (APV) is used for the valuationValuation MethodsWhen valuing a company as a going concern there are three main valuation methods used: DCF analysis, comparable companies, and precedent transactions. These methods of valuation are used in investment banking, equity research, private equity, corporate development, mergers & acquisitions, leveraged buyouts and finance of projects and companies. It takes the net present value (NPV), plus the present value of debt financing costsCost of DebtThe cost of debt is the return that a company provides to its debtholders and creditors. Cost of debt is used in WACC calculations for valuation analysis. Learn the formula and methods to calculate cost of debt for a company based on yield to maturity, tax rates, credit ratings, interest rates, coupons, and, which include interest tax shieldsInterest Tax ShieldsThe term "interest tax shields" refers to the reduced income taxes brought about by deductions to taxable income from a company's interest expense. For instance, there are cases where mortgages may have an interest tax shield for buyers since the mortgage interest is deductible against income., costs of debtCost of DebtThe cost of debt is the return that a company provides to its debtholders and creditors. Cost of debt is used in WACC calculations for valuation analysis. Learn the formula and methods to calculate cost of debt for a company based on yield to maturity, tax rates, credit ratings, interest rates, coupons, and issuance, costs of financial distress, financial subsidies, etc.. Calculate the value of the unlevered firm or project (VU), i.e. its value with all-equity financing. To do this, discount the stream of FCFsFree Cash Flow (FCF)Free Cash Flow (FCF) measures a company’s ability to produce what investors care most about: cash that's available be distributed in a discretionary way by the unlevered cost of capitalUnlevered Cost of CapitalUnlevered cost of capital is the theoretical cost of a company financing itself for implementation of a capital project, assuming no debt. Formula, examples. The unlevered cost of capital is the implied rate of return a company expects to earn on its assets, without the effect of debt. WACC assumes the current capital (rU). Sum up the value of the unlevered project and the net value of debt financing to find the adjusted present value of the project. That is, VL = VU + PVF.